Duodenal diverticulum is the diversion of duodenum. Duodenum is the part of intestine. In duodenal diverticulum, a small pouch is attached to the 1st part of duodenum which is just below the stomach. There are two main types of duodenal diverticulum I.e. intramural and extramural diverticulum. Extramural diverticulum involves outer membrane of duodenum and sticks to the outer surface. It is the common type and occurs in almost 6 Percent of cases. Intramural diverticulum is the rare type and does not protrude from duodenum but involves lumen of duodenum. Both the types have connection with lumen so contents of duodenum may enter into diverticulum. It is an asymptomatic condition but 10 percent of cases may show symptoms. Common symptoms are pain in upper abdominal region. Tenderness in upper right quadrant. Patient may have feeling of fullness and discomfort. Nausea and vomiting are associated with abdominal pain. These symptoms appear after having meal I.e. patient feel discomfort and vomit out the food. 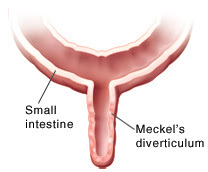 Diverticulum may oppresses bile duct and causes abdominal pain. It may lead to intermittent jaundice. Sometimes excessive vomiting can cause weakness and sometimes patient become faint. These symptoms need treatment on urgent note. Otherwise these can prove fatal for patient. The exact cause of extramural diverticulum is not known yet, but some scientists reported that it may be acquired not congenital. It can occur secondary to herniation of duodenal wall. Different types of diverticula have different causes behind them. When we talk about congenital diverticulum, it is a rare condition which occurs during fetal development. There are two types of duodenal diverticulum on the basis of its causes I.e. primary and secondary diverticulum. Primary diverticulum may occur congenitally. Whereas secondary diverticulum occurs as a result of duodenal ulcer and chronic cholecystitis. It is also termed as false diverticulum. Usually treatment is not needed. But if treatment is required, then extramural diverticulum can be removed easily via surgery. Because it is present outside the duodenum. Intramural can be removed by making a small incision on lumen of duodenum. In some cases, diverticulum is inverted but does not removed. It is left attached to the walls of duodenum. If more than 2 diverticula are present, then billroth II gastrectomy is performed. Surgery is the only treatment option because medicines cannot help in treating duodenal diverticulum. But medicines can relieve symptoms. Diet role in duodenal diverticulum is not much clear. Fibrous food is recommended because it increases gastric motility. It is believed that low fibrous food can cause duodenal diverticulum. Patient is asked to take liquid diet I.e. increased water intake, broth, ice pops and fruit juices etc. After some time patient will gradually move back to normal diet. Physician will recommend low fiber food intake before introduction to high fiber food. Because high fiber food helps a lot in digestion and bowel movement. It also reduces pressure in small intestine. There is a fiber intake limit per day which should be followed regularly.